Let us begin at the beginning. We have done a fair bit of safariing over the last 4 years. India, South Africa, Zambia, Botswana, Kenya. We have lived in rondavels, lodges, chalets and tents. We have self-catered, eaten out and been pampered with personalized chefs and menus in luxurious private villas. We have self-driven and been driven around. We have walked and canoed – mokoroed – in the bush. The only thing we have not tried is really roughing it out. We have saved for and spent on some creature comforts. Okay, on quite a few!! 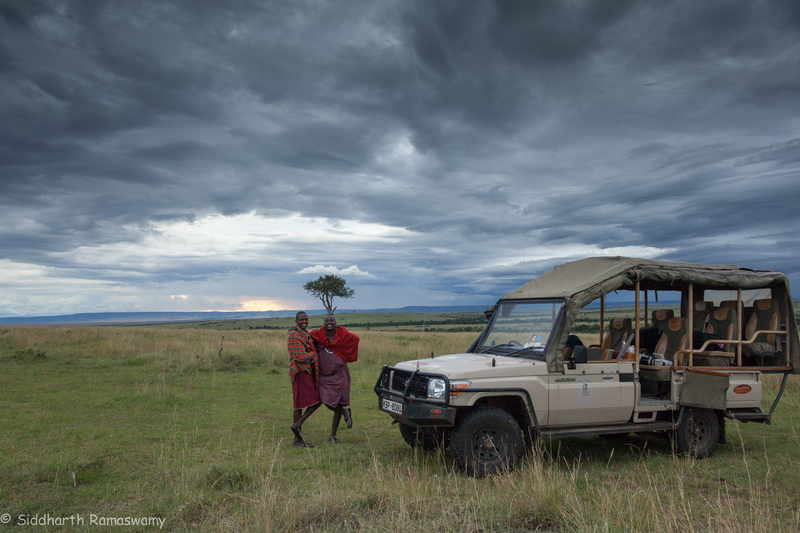 If you can only ever do one safari in your life, do it with Gamewatchers at their Porini Lion Camp – Olare Orok conservancy, Masai Mara, Kenya. If you can manage it, request for the tracking and driving duo John and John – Little and Big! And ifyou really want that fantastic holiday with none of the headache involved in organising it, go to our photography mentor, David Rogers! He will take care of the nitty gritty! All this may come at a marginally higher price than the normal tourist package. But if you want that safari experience of a lifetime – do this. We visited this camp over Easter 2013. It is considered off-peak season (most visitors like to come to the Masai Mara during migration). We were certain about the beauty of the land we were going to see. We were sure about seeing some fauna. We were reasonably sure about the hospitality and comfort of the camp. We have begun to take this for granted. This is Africa! And yet, this time, it was different. We got magic. Rain in the nights and beautiful, cool days for the drives. It was perfect weather for visiting the Mara. Fresh green landscape. New bloomed wild-flowers. Birds of all hues. Animals aplenty. Graceful giraffes. Zebras with their soulful eyes. Wildebeest grazing in their hundreds. Buffalo wallowing in the new mud pools. 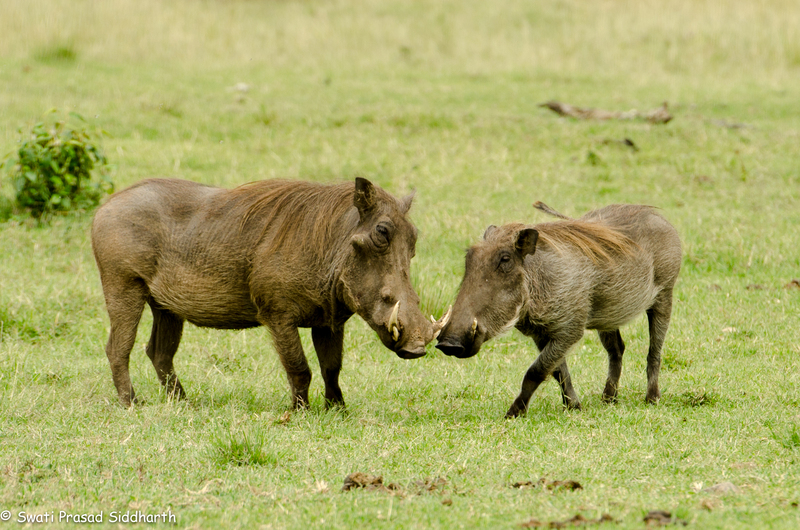 Warthogs, Hyena, Topi, Impala, Gazelles, DikDik, Eland. 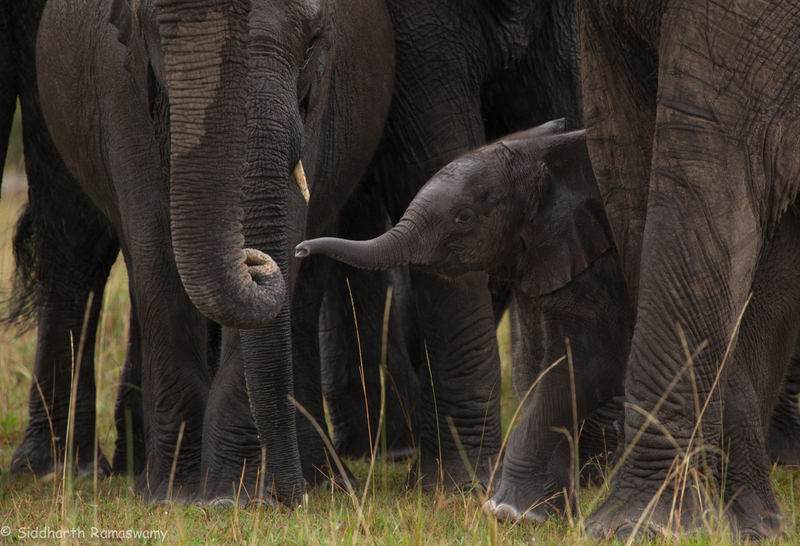 Elephants with calves from a week old to teenagers! It may have been off-season but we got to see a “river crossing” nevertheless. We even met an owl in broad daylight and a leopard tortoise. This is where the phrase raining cats and dogs came alive! At least, it rained and poured! The river flooded and breached its embankment. And the cats came out to play. With us! Lions, cheetahs, leopards. Adults, sub-adults, cubs. New-borns with their eyes still blue and unclear. A Leopard sleeping on a tree, another patrolling her territory with her daughter, another playing with her baby. Huge kills stashed in trees for safety. Cheetah brothers playing with each other, mother and cubs feeding, Another mother and cub hunting! 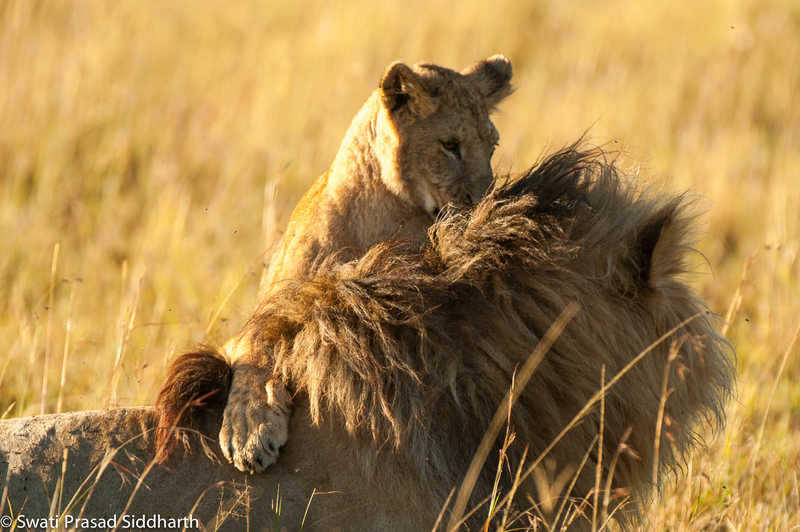 Over the weekend we spent a lot of time with five different prides of lions – watching them eat, sleep and interact with each other. We saw indulgent parents playing with their little ones. We saw infuriated fathers swatting off the mischievous ones. Lionesses with cubs, one, two, six months old. Prides with up to 14 cubs. Massive lions resting after a huge meal. Cubs frolicking with each other and with their seniors. Can anyone ask for more over a weekend? Yes. And get it too. Outstanding guides and trackers. Wonderful accommodation. Friendly camp staff. Delicious food. And a hot shower on request! This is a dream come true! We began our trip encountering Olive, a gorgeous leopardess, on our way to camp from the airstrip. A few minutes after we left her we met a huge lion sleeping in the shade of a bush – replete with food! He was too full to even acknowledge our presence. Two big cats within 15 minutes in the bush is unusual in itself. We encountered a herd of buffalo. Young and old, they teemed around our vehicle. A little one seemed very unsteady. It soon became apparent why – his mother still had the placenta attached to her body! He must have been born but a few minutes ago! This explained why the big bulls were so wary of our presence. Protecting the young comes naturally to all creatures big and small. 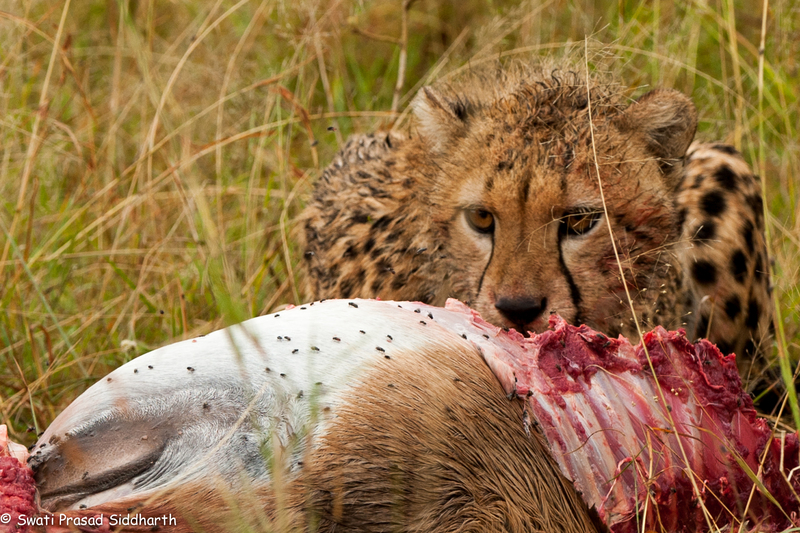 In the afternoon we met Narasha, a Cheetah, with her daughter and son feeding on a fresh kill. The cubs were so hungry, they barely got their head up from the meal. Not a pleasant sight. But no doubt they found the food lip smacking!! Later in the evening, we met Naibor. The lioness was in a little grassy hollow all by herself. Or was she? A little movement at her side and her four one-month-old cubs crept out looking at us curiously. Soon, they were out and playing and tumbling over each other in this new-found world. They were incredibly cute to watch and we spent some time with them. When she decided that she had had enough of us, she started to lead them away into the bush. Our guides John and John told us more about her pride, about how the cubs needed to be older before Naibor went back to the pride with them and a lot about lions in general. 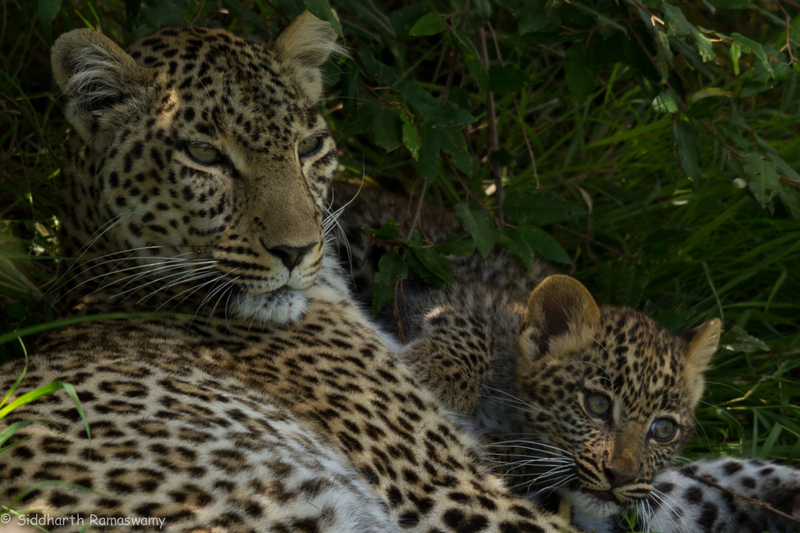 On the banks of the Ntiak Ntiak river, we met Acacia, another leopardess and her two-month-old cub. She had hung her food high up in the tree above her.The little one was busy playing with her mother and clambering all over her. The next morning we met Olive again. She was with her daughter, Saba, who had hunted earlier for both of them. Mother and daughter, after feeding, left the remains on another tree branch and walked calmly down the track with us following in blind adoration. It was a classic African bush scene. A tree, burnt grassland, golden cheetahs against a blue sky. Malaaika, with her cub. This peaceful setting was deceiving. For Malaaika had spotted her next meal. With careful planning and infinite patience, she wound her way around the poor sleeping gazelle. At the last possible second, she broke into the chase. 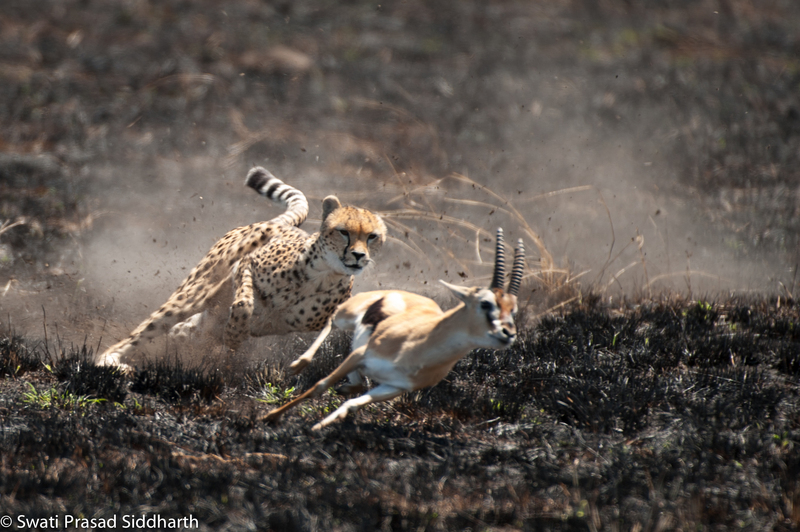 Just a moment too late, the gazelle leapt up and made a dash. Both predator and prey were poetry in motion – at high speed. The gazelle put in a brave effort but lost the battle. Today, Malaaika and her child ate. 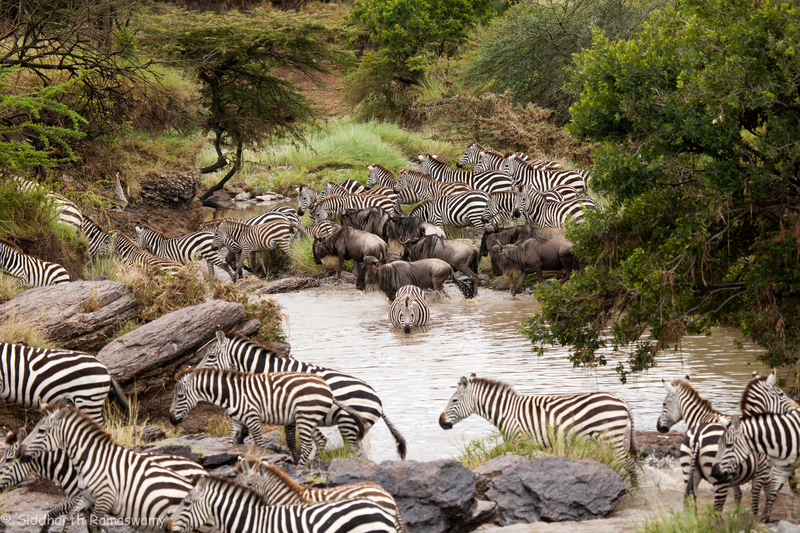 Maybe due to the previous night’s rains, the zebra and wildebeest decided they needed to cross the river. So we witnessed that amazing sighting “the crossing”- out of season! 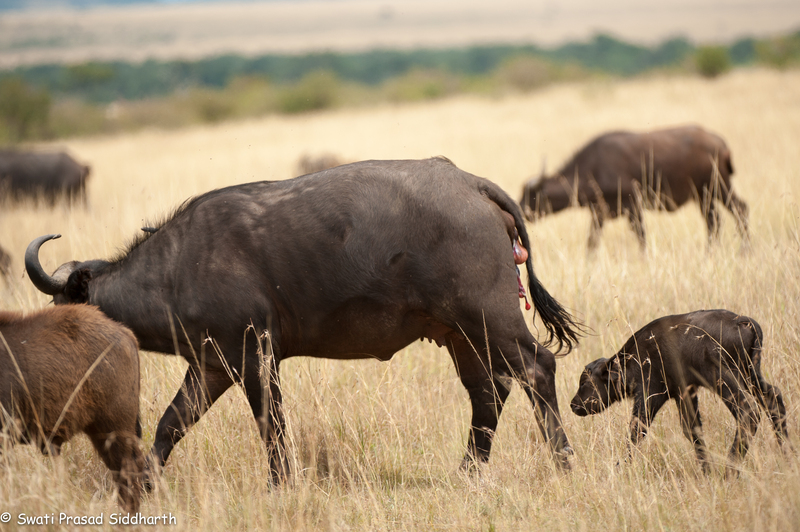 – which is the climax of any “migration” safari in the Mara. Hundreds of these two species gather for hours at a particular point on the banks of the river. At some un-understood-by-man signal, the mass of animals makes a frenzied dash from one bank to the other. They all converge at this one narrow path and rush in head long. In the Mara river, this is where National Geographic and Discovery channels get those spectacular shots of the crocodiles hunting prey after prey. The marabou storks and the vultures hover in anticipation. The hyenas lurk in the background. It’s feasting season. There are no crocodiles in the Ntiak-Ntiak. Nevertheless, the sight of these hundreds of animals gathering to some unknown call was a sight to behold. Suddenly the mass moved into the water. It was confusion, water splashing, animals running pell-mell into and out of the river. As suddenly as it began, it was over. A few zebra remained on the opposite bank looking unsure of their next move. Everything was quiet. And just when we thought we had seen it all, the huntress appeared. John and John said to us how she was just a few minutes too late. The moment of crossing is when the wildebeest and zebra are most vulnerable. Their entire focus is on the water and they are easy prey. We were disappointed by the lost opportunity for “shooting action” but also secretly relieved that there was to be no bloodshed! Big John started reversing the vehicle. A moment later he stopped. Before we could ask, he asked us to watch … Something was definitely going to happen. “Look at her”, he said. Skulking at bush level, she was creeping slowly but surely to the river. She was definitely on the prowl. As we watched her, the zebra on the opposite bank had formed another mass and in a split second began crossing again. The first few climbed onto our bank. Focussing on her target, she paused for a moment. 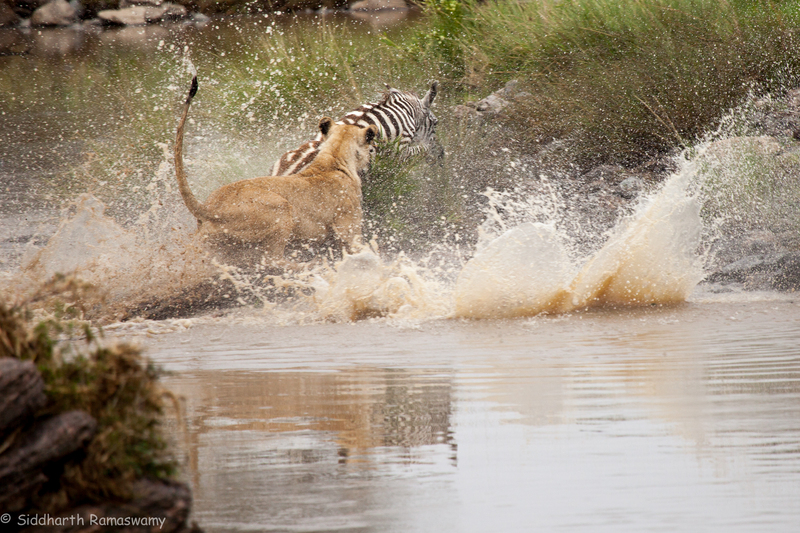 The zebra turned and headed back into the stream in a desperate bid for its life. In one fantastic leap, Naibor had fastened her jaws on the neck of her prey. It was life and death at its most elemental. Not for a moment did she lose her grip as she literally swung from one side of the zebra to the other, getting under and pulling the poor creature down. 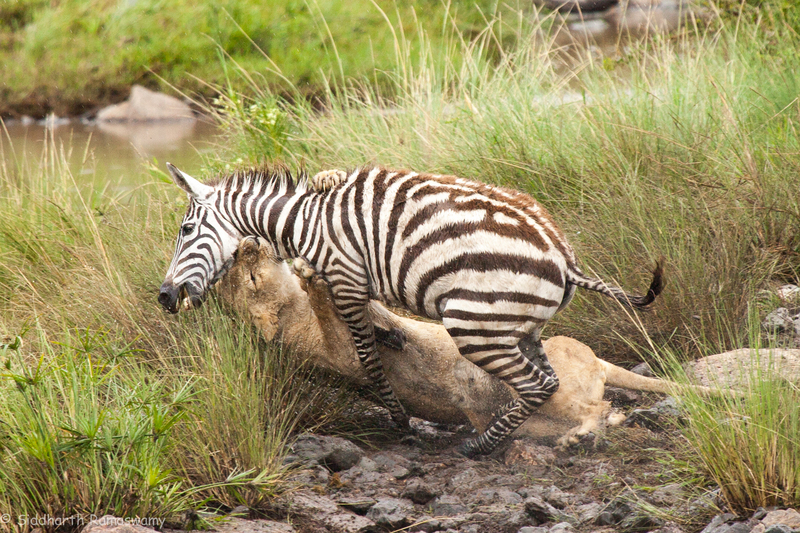 The zebra was fighting for all it was worth. But Naibor was fighting not just for her meal, but to stay alive to feed her cubs. Others in her pride also depended on her for food. She could not fail. She did not fail. The next few moments she kept her death grip on the neck keeping absolutely still. Only after the last breath of the zebra had passed did she loosen her hold and let the dead animal fall back. Then she looked up at us. Not in triumph but with a quiet satisfaction – she had hunted successfully. An hour later, there was the skin of the zebra, a couple of shreds of meat, some bones, 10 well fed lions and, hopefully, four well-fed cubs. Yet, somewhere, there might be an orphaned zebra foal – we shall never know. 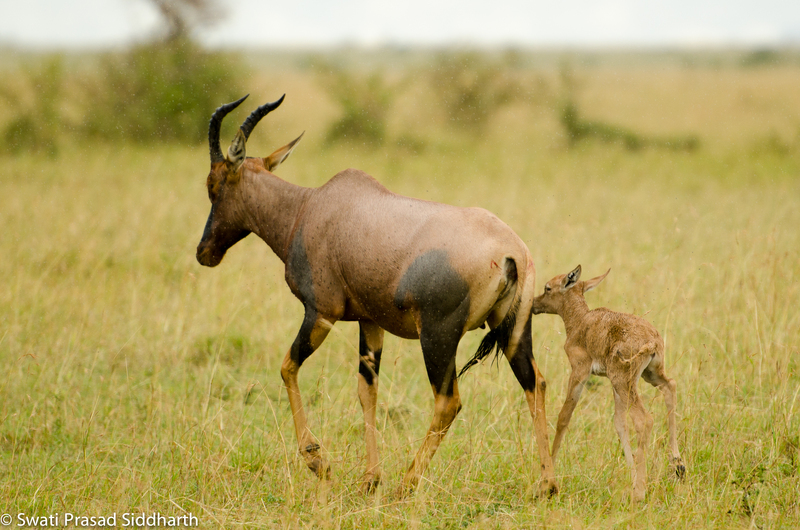 As the adrenalin from these encounters was draining away, we saw a new born Topi, probably less than an hour old, tumbling along beside his mother who was still bloody after shedding the afterbirth. A little further on we met a herd of elephants. Big and small. Just as we were exclaiming at a particularly small one – John said maybe three months old at most – a movement to the back of the herd caught our eye. And a calf emerged – no more than a week old, if that! A little further down the track was a pair of horns that belonged to a long dead buffalo. We remembered the new born one of two days ago. And thus in the midst of death life renews itself at Olare Orok, as indeed in the rest of the African bush. We all know about the food chain. We know about survival of the fittest. But to see it so starkly is incredibly humbling. As humans we are caught up in our petty every day greed. We never consciously acknowledge that life and death lie at every breath and no amount of material wealth will ever change this. This was a timely reminder. I’ve had the pleasure of seeing Swati and Siddharth in their natural habitat, viz., in a 4×4 on a dirt road with a camera at the ready and a lion around the corner. They have a deep love for the animals they photograph and write about, and that love is obvious in this blog. Reading it has left me a little more in awe of the world we live in, and thankful that there are people who delight in it the way Swati and Siddharth do. awesome and evocative. You are blessed indeed to be there, see the live performance and narrate it breathcatchingly. Thank-you, Arthika. The wildlife is awesome! Thank-you Anupama. Looking forward to ideas and critique from an established “wildlife author”!! And to sharing all these experience with you! SIMPLY FASCINATING ! YOUR PASSION FOR WILDLIFE IS INDEED VERY EVIDENT! Swati – you lucky lucky lady!! What a wonderful trip, and you have done total justice to what you were so privileged to see, both with pen and shutter! The images do not overwhelm the prose and the prose paints in so many other details. Looking forward to the other updates!! Thank-you David. I appreciate the encouragement. I read the article (story) you composed with ‘pen and shutter’ ~indeed a worthy read! Thank you for sharing with the world such a marvelous opportunity you were blessed to experience. A story only has value if it is told ~and the story of your trip …a wonderful moment shared. I wish for you success in all your endeavors, and I am blessed to have gotten a glimpse into your life and world. Few humans recognize the truth of our fragile existence as they seek to fulfill their avarice, lust, greed… you, my friend, are on ‘the right path’. Hi Honey, your pen and shutter, have certainly inspired me to add this to my bucket list of experiences( to be had in my lifetime!). You have such a penchant for writing and one that engrosses the reader! So keep writing and posting pictures. I would take the advice given by someone earlier about not posting life size pics, because they would be very tempting to steal!! Look forward to more from your end! Thank you sjbrown. Yes. That is a very real concern, though I guess if someone stole our pictures it would be a sort of back handed compliment! But seriously, we agree with you. Love the shots. I would shy away from linking them to full size images, this makes them easier to steal. That is the big challenge with the internet. Someone can print and crop out your copyright info. Thanks for sharing. How many pictures do you want to see?!? I can offer you between a few tens to hundreds to thousands! Thank-you Chantel, Sushmita & Rama. No words and photographs will ever do justice to this land. You must come and experience it for yourself! Iiisvenky – it WAS a fantastic experience! Sushmita, Thank-you. I am not sure about the number of people who would be willing to see a few indeed, never mind a few thousand pictures! But yes, I like the idea. I just need to figure out how to incorporate it now! Ooh! Sounds like its been a fantastic experience !! Lovely… Felt very much part of the safari. The ‘pen’ part of it is in place, what about seeing more of the ‘shutter’? 🙂 Maybe links to make these little stories come alive…the moments before the ‘something is going to happen’, the satisfaction after etc. You have some really gorgeous images between the two of you, which should be showcased.